Some roses are so praiseworthy that a gardener just has to have one. Some are too famous to ignore. Some have sentimental reputations. Some just get grabbed, thoughtlessly, in a rose sale. Welcome to my garden, Archduke Joseph, often spelt Archiduc Joseph. Well, he certainly has delivered. He's a manly sized shrub, and his repeat flowering is amazing. It's not just the odd bloom, it's as if the whole shrub rejuvenates in late summer. I'm writing this in late autumn and again he's covered in flowers (which the early frosts are making a little spotty and scruffy). The blooms are quite flat, with lots of petals squashed together, a blend of colours - copper, pink, soft orange, russet, apricot... As you can see, the colours look quite different in different seasons and light conditions. In the rose catalogues he smells like fine old china tea. To my untrained nose there's barely a hint. Sorry about that! Archiduc Joseph was named after a great plant collector - Archduke Joseph of Austro-Hungary. 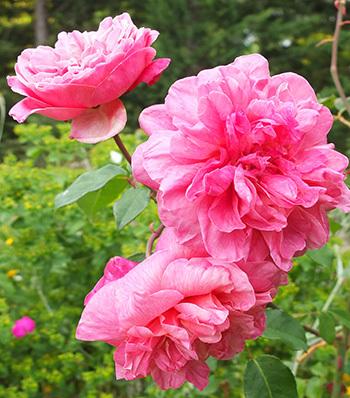 He is a tea rose, of Chinese heritage, and was introduced in France in 1872. That makes him quite old!